Preparation Time 10 / 15 Minutes. Cooking Time 10 / 15 Minutes. **Adjust this if you are cooking this late afternoon as you could do this first thing in the morning and leave until you are ready to barbecue. Whisk together in a bowl the ingredients for the glaze making sure that you use plenty of pepper. Heat your Black Knight barbecue. 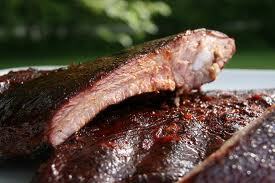 Remove the ribs from the marinade and place them on the grills when the barbecue cools are ashed over. Grill until they cooked through, turning them occasionally. This could take 10 / 15 minutes depending on heat and how you prefer them to be cooked. Brush with the glaze and cook for 1 minute. Serve with the remaining glaze.